Shirley Singleton Sorrell, 78, of La Grange, passed away on December 25, 2018, at Kitty Askins Hospice Center in Goldsboro, after a brief illness. Visitation will be Friday, December 28, 2018 from 5:00 p.m. until 7:00 p.m. with a memorial service immediately following at La Grange First Free Will Baptist Church in La Grange, North Carolina. Shirley was born in Pine Level, North Carolina to Kirby and Lola Gurley Singleton on October 9, 1940. She went to La Grange High School and Hardbarger Business School in Raleigh. She married Vernon Sorrell on December 27, 1964, at La Grange First Free Will Baptist Church in La Grange. She worked for General Motors for 30 years and was able to retire in 1992. 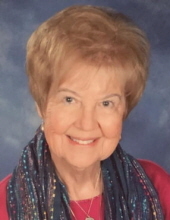 Shirley was an active member of La Grange First Free Will Baptist Church, former La Grange Rescue Squad volunteer, Red Cross volunteer and a participant of the Galaxy of Sports bowling league for many years. Shirley is preceded in death by her parents and brother, Kenneth Singleton. Shirley is survived by her spouse, Vernon Sorrell; two children, Vicki Lemmond and Eric of Cedar Point, Greg Sorrell and Donna of Greenville; grandchildren, Monica Swinn and Mike, Autumn and Hunter Sorrell, all of Greenville; two great-grandchildren, Colton and Everett Swinn of Greenville, and a sister, Ann Kennedy and Ronald of Pink Hill. In lieu of flowers/plants, please consider memorial donations on her behalf to La Grange First Free Will Baptist Church, 802 South Caswell Street, La Grange, NC 28551 or designated for the Kitty Askins Hospice Center through 3HC, 2402 Wayne Memorial Drive, Goldsboro, NC 27534. The family of Shirley wishes to extend our sincere thanks to Dr. Luz Barahona of Kinston UNC Pulmonology, 3rd floor staff of UNC Lenoir Healthcare, and the staff at Kitty Askins in Goldsboro. Arrangements are entrusted to Rouse Funeral Home. To send flowers or a remembrance gift to the family of Shirley Singleton Sorrell, please visit our Tribute Store. "Email Address" would like to share the life celebration of Shirley Singleton Sorrell. Click on the "link" to go to share a favorite memory or leave a condolence message for the family.